Chemistry is simply the study of electrons moving around. Molecules form when atoms share or donate electrons. 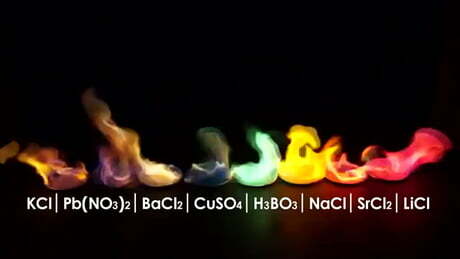 A chemical reaction is the moment when electrons exchange between atoms of different molecules. This section is a crash course in chemistry. It’s a lot of information, but I have confidence in you! Electrons are the name we give to the condensations of energy with a specific harmonic resonance. The string resonance gives electrons a very small mass as well as two other attributes that we call charge and spin. Electrons were arbitrarily given a negative value for their charge. That negative was meant to signal it as the opposite charge of a proton. The spin of an electron can be one of two types; the types are opposite each other, much like with charge. Electrons and protons are attracted to each other so that their charge frequencies can cancel out due to destructive interference. Similarly, two electrons in the same atom will pair up in what we call an orbital in order to destructively interfere their opposite spins, lowering the overall energy. Example time! First, let’s look at the hydrogen atom: the simplest atom with only one proton and one electron. The electron orbits around the proton at specific harmonic distances from the proton. We’ll call each distance an energy level, though I sometimes refer to them as “electron shells” These distances are the exact harmonic wavelengths that allow for the total destructive interference of the charge attribute, therefore stabilizing the overall energy. Now is when things get weird. Electrons are forbidden, due to a possible increase in energy, from traveling between energy levels. Instead, the electron disappears from one energy level and then reappears in another. The electron can jump to a higher energy level only if it absorbs a photon. The energy from the photon is then given to the electron whose energy is higher at the higher energy level. Don’t you just love when names are helpful? When an electron drops down to a lower energy level, a photon is given off with the exact energy of the difference in energy levels. That energy is represented in the photon’s wavelength, what we see as color. Each element has a different number of protons which means that each element has its own particular distances between energy levels. The orbitals of atoms are arranged based on harmonics of energy levels and they are always stabilized when the orbitals are all filled. Imagine each energy level as a harmonic wavelength, like the following image. The first energy level has a 1st harmonic meaning there are only two nodes. The first energy level can hold a total of two electrons that cancel each other’s spin. The second energy level has a 1st and 3rd harmonic, allowing for 8 (2 + 6) electrons to fill up the second level. The third level has a 1st, 3rd, and 5th harmonic giving enough orbitals for 18 (2 + 6 + 10) electrons. The 5th harmonic of the third energy level is actually higher in energy than the 1st harmonic of the fourth level. This causes the third level 5th harmonic to be fairly empty. This basically means the fourth energy level will accept electrons before the third level fills up entirely. Elements with only partially filled 5th harmonic orbitals have open slots for free electrons to fill in before moving on to another atom. This is the reason metals are conductive, they have many open orbitals for passerby electrons to jump between atoms. Electrons can also shield the positive charge of its atom’s protons. Electrons closer to the nucleus can absorb the emitted photons and essentially block the electric field. However, electrons and protons have equal charges and the concentration of protons within the nucleus outweighs the electron’s charge. This means that the electrons on the outside layers also help out with shielding, but have a lesser effect. The outermost electrons are called valence and they are far enough away from the nucleus to have only a weak attraction inward; the shielding weakens that attraction even more. 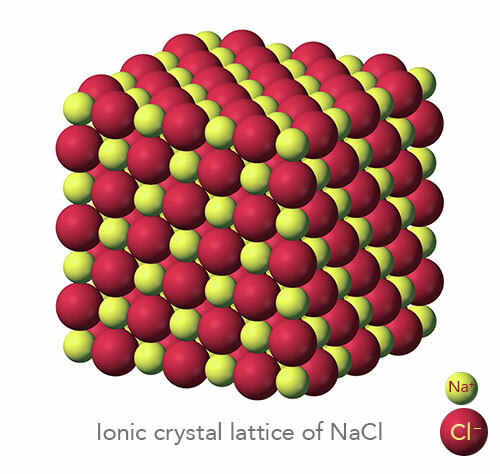 Elements with more protons have a stronger pull on the valence electrons and those with nearly full valence shells are more likely to attract an extra electron to fill up the valence shell, vastly lowering its overall energy. An extra electron would cause the atom to become charged, we call this an ion, but the energy benefit from having a filled outer shell is worth the energy spike from becoming charged. Elements with only a few electrons in their valence shell are willing to lose electrons in order to use an already filled energy level as its valence shell. Atoms that lose electrons will form overall positively charged ions while atoms that gain electrons will become negatively charged. The electromagnetic force will take over from here, allowing ions to ionically bond with each other to form repeating structures; we call these types of compounds salts. Trading electrons is not the only way to form full valence shells of electrons, they can also share. Many of the elements that have only a few empty spots in their valence shell are able to share some of their valence electrons so that both atoms can attain the lower energy form. The sharing of electrons is called covalent bonding and it results in the electrons swapping back and forth between atoms. Molecules that have unpaired electrons will automatically form covalent bonds with hydrogen atoms in order to fill up the orbitals and reach a full valence shell. Think of hydrogen as that friend that’s always down to hang; whenever you have an empty space on the couch or in the car, he’s already there. Hydrogen is that friend who is always down to pick up or drop off an extra valence electron. Molecules that already have formed bonds can have their bonds broken if the electrons of another molecule cause a chemical reaction. Most reactions occur when electrons from molecule A are in a higher energy orbital than an open orbital of molecule B. To lower overall energy, the electron will jump from molecule A to molecule B. Chemical reactions reassign electrons, breaking old bonds and forming new ones. Sometimes chemical reactions require heat to raise the energy of an orbital of one of the molecules as well as to increase the movement and likelihood of molecules bumping into each other. Anything that increases the probability of a reaction to occur is called a catalyst. There’s a reason most cooking recipes call for heat, cooking is just an edible form of chemistry. With this information, as well as a bit of practice, you are now equipped to understand nearly all chemical reactions that take place in nature. You might need some time to look up the exact attributes of a specific element but you’ll gain your chemist legs sooner than you think!